Medik8 products ship within Australia only. Medik8 is a pioneering skin research company, working in the field of 'sensitive skin green cosmeceuticals' that give results ... without the irritation! The carbon-neutral company uses natural ingredients whenever possible and is dedicated to bringing professionally formulated, highest quality, and 100% paraben-free skincare products to market. Medik8's development team consists of biochemists and pharmacologists with over 40 years of combined experience in skincare research and product formulation. All the brand's products are processed in small batches to ensure freshness, stability, and potency. Medik8 incorporates the best ingredients at the correct strength to address common skin problems such as hyperpigmentation, blemishes, and hypersensitivity. For example, a particular antioxidant actually loses potency when in concentrated form. The development professionals at Medik8 research the correct concentration that will deliver the best results. Medik8 is proud to tailor its formulas to different skin types and needs. 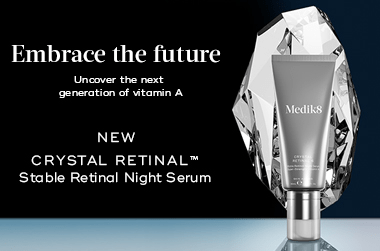 Through intensive trials, Medik8 has determined that vitamin C, vitamin A, hydroxy acids, and sunscreens are the best ingredients for age-defying skincare. Such ingredients remain stable and are effective at addressing dry lines and wrinkles while moisturising the skin. Since Medik 8 upgraded this formula last year, it has not lived up to expectations and is not as good as the previous night ritual in the red jar. My skin continually peels, is dry and not as glowing as it was when I used the old formula. Like the other reviewer I also had a raised red patch under my eye which took a few days to clear, even though product was not used under eye. Disappointed with this product. Started using this retinol a few weeks ago after previously using the dermalogica 1% retinol. I really like this retinol so far. I love that it’s a serum and I can put on moisturiser afterwards and not feel like I’m applying too much cream to my face. I have been using it every night and have a only had the smallest amount of irritation where I’ve applied it too close to the fine skin around my eyes. It absorbs quickly and doesn’t feel greasy at all.